makes it easy to enjoy all of your favorite online content on a TV screen with the simple press of a button on your phone, tablet or laptop. We want to make it easier for that content to get to your TV, so today we’re releasing the Google Cast Software Development Kit (SDK) for developers who want to build Chromecast support into their apps and websites. For the rest of us, that means even more of our favorite movies, TV shows and music will become available on Chromecast as developers work with the SDK. Just be on the lookout for the cast button in your favorite apps and websites across Android, iOS and Chrome. If you’re a developer looking to bring your content to the big screen, head on over to the Google Developers Blog for a deep dive into the nuts and bolts of it all. Meanwhile, for everyone else, a current list of apps that work with Chromecast can be found at chromecast.com/apps. Happy casting! 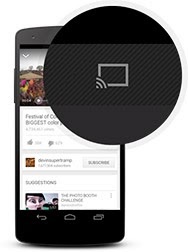 Chromecast makes it easy to enjoy all of your favorite online content on a TV screen with the simple press of a button on your phone, tablet or laptop. We want to make it easier for that content to get to your TV, so today we’re releasing the Google Cast Software Development Kit (SDK) for developers who want to build Chromecast support into their apps and websites. For the rest of us, that means even more of our favorite movies, TV shows and music will become available on Chromecast as developers work with the SDK. Just be on the lookout for the cast button in your favorite apps and websites across Android, iOS and Chrome.